UPDATE November 19, 2013: I have a major followup to this post here. Update June 25, 2016: I have yet another followup here. 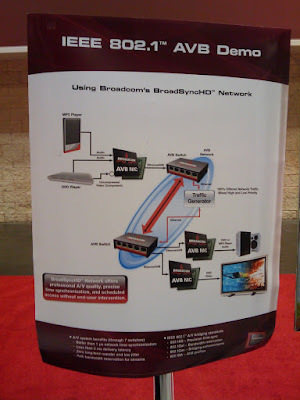 One of the very interesting things I saw at Infocomm was a live demonstration of IEEE 802.1 AVB (Audio-Video Bridging). Ellen Juhlin from Meyer Sound told me about the demo, which is of particular interest to Meyer since they are using the technology as the core of their new D-Mitri product line (basically, the replacement for the Meyer/LCS Matrix 3 system). At the demo, I spoke with Robert Boatright, Director of Research, Harman Corporate Technology Group, who has a great writeup on the system for Embedded Systems Design (ESD) Magazine, which is available online here. A multiyear effort by the IEEE 802.1 Audio/Video Bridging (AVB) Task Group is nearing completion on a series of enhancements to the legacy Ethernet standards that enable the delivery of time-synchronized, low-latency audio and video over Ethernet networks--with perfect Quality of Service (QoS)--while retaining 100% compatibility with legacy Ethernet networks. IEEE 1722, the AVB Transport Protocol (AVBTP), has further built on the development of AVB by adapting IEEE 1394's comprehensive suite of media formats, encapsulations, and synchronization mechanisms for use in Ethernet AVB networks. Products using IEEE 802.1 AVB and AVBTP standards are now being introduced that enable the construction of highly interoperable Ethernet networks capable of streaming audio and video with perfect QoS. To translate this tech-ese and expand on it a bit: 802.1 AVB is offering synchronized transmission of multi-channel audio and video with a 2 millisecond throughput time over open-standards-based Ethernet, with one catch (see below). And it's working today. Harman's pro division is obviously interested in this, but I would guess their consumer divisions are very interested too--think about replacing that mess of cables and interconnects in a typical home theater with simple, low-cost Ethernet. For someone like Meyer, AVB offers a very effective backbone for their new products that is potentially interoperable with other manufacturers. (It's interesting that they chose stage monitors for their example, as these are some of the most time-critical applications in live sound). Sound expensive? It doesn't need to be, because major companies like Broadcom, who make the chipsets used by major switch manufacturers, are integrally involved in the standards effort. In fact, in the small picture at the top of this entry (click for larger image) you can see a BSS (Harman)-branded Netgear switch running the AVB Broadcom switch chip. I spoke with Yongbum "Yong" Kim from Broadcom at the show, and Broadcom is very much behind this, as are other major players in the field. This looks like it could be a very cool technology for both consumer and pro audio/video applications. Mr. Boatright said that the group is now looking into the possibilities of including some control in or with the standard, so of course I recommended that he look into ACN right away.